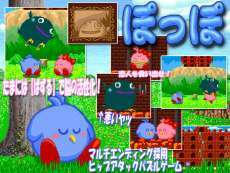 Poppo is a multi ending hip-attack puzzle game originally developed in 1997. It was featured in the "Indie Corner" section of TECH Win, a PC magazine back in the day. Since it relied on the outdated WinG graphic library it couldn't be supported on modern PCs. In 2016, they resurrected this retro puzzler for modern indie fans. If you control all the fruits in the screen by manipulating the pictures of my character, it is stage clear. Since the fruit is also in the place surrounded by the wall, please make a path so far with a hop attack by a hopper. Only hip attack can use number of fruits that I ate. If you make a mistake in order to eat fruits or a block to break, you may not be able to go to the place of fruit. If you can not clear it anyway, please push the abandon button [space key]. There are 3 kinds of endings depending on the multi-end adoption, clear time.